踊る夏、日本の夏！ / Dancing summer in Japan! Hello, this is Goo-Noo, a new member of this blog team!! I am looking forward to telling you fun stories from Japan! Anyway, what’s your plan for this summer? Beach, camp, travel, fireworks, BBQ, watching baseball, eating Somen noodles, etc… Japan’s summer has got a lot to offer. I went to Bon-dace last weekend and I loved it! “Bon” refers to a period in August when families reunite and pray for the spirits of ancestors. 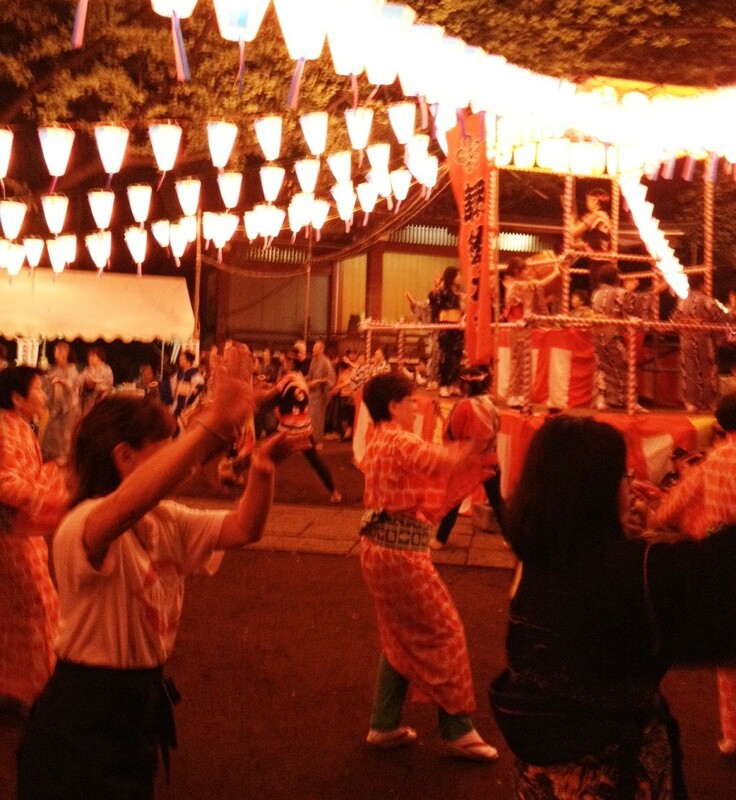 Bon-dance is one style of such spiritual celebration, and this dance has evolved into a traditional summer dance seen in what we call “summer festivals”(“Natsu-matsuri”). The styles and music vary from region to region. With a big stage called “Yagura” in the middle, people lining up in a circle dance counter-clockwise. Here is why I love Bon-dance. First, it’s easy! No fancy movements at all. You can just dance like other people around you. Anyone can join and enjoy the tradition. Second, it’s actually a good exercise for you. Usually there are small food courts called “demise” in summer festivals, so people tend to eat and drink a lot. Bon-dance gives you a break and even though the moves are very slow and simple, it could make you very tired very fast. Finally, it is a lot of fun! This dance could be love dance with your date, or just fun dance with your friends and family. Dancing in the hot summer night, making good moves, eating good food... There is no better way to spend Japanese summer in a traditional way. Oh! No plan for summer yet? Don’t worry. Why don’t you go look for some Bon-dance near your town?